A worldwide phenomenon like Pokémon Go is fascinating to me. Two weeks ago, we were all quietly going about our business, blissfully unaware that our lives were about to change. OK- perhaps a tad dramatic, but overnight, everyone started talking about this game and Nintendo’s shares shot through the roof. They have increased 60 percent since this time last year. CNBC reported that people are spending an average of 43 minutes a day on the new smartphone app – far surpassing the time spent on Twitter, Whatsapp, and Instagram. Normally I would greet the release of a smartphone game with complete indifference. I am not a gamer by any stretch and frankly, I am satisfied with a cheeky game of solitaire every now and then. 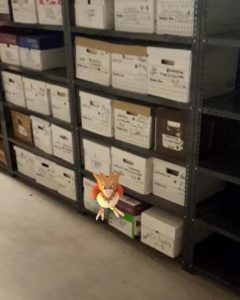 But that was until I learned that those pesky little critters were popping up in archives, at historical sites, and in museums. I decided to download it and see what the fuss was all about. 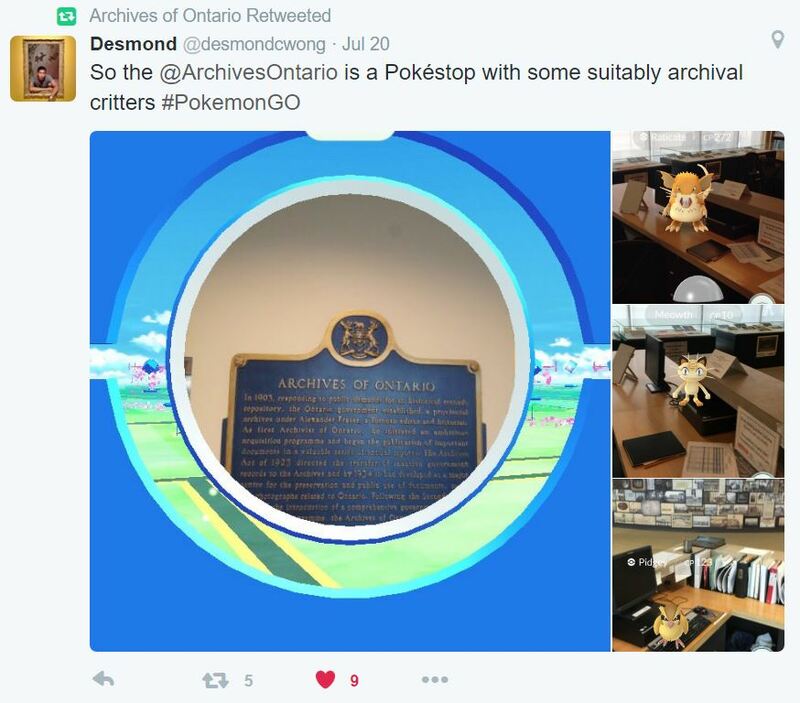 No luck finding any at my archives, but if you’re in the neighbourhood, grab some Pokémon at the Archives of Ontario. According to a recent tweet, their reference room is just crawling with them! Further down the 401, Archivist Rodney Carter even found one hanging out at the Archives of the Religious Hospitallers of St Joseph in Kingston. Last week, the Director of the Franklin D. Roosevelt Library and Museum blogged that Pokémon Go had come to the museum and it was a good thing. He joked that perhaps this was the end of civilization. But it isn’t. This could be an amazing new outreach opportunity for museums, archives, libraries, and historic sites because the game encourages people to explore. The wonderful thing about this game is that it includes ‘poke stops,’ which are interesting places and monuments where you can pick up items for the game. Hopefully, people will look up for a few minutes and experience these new places and perhaps they will learn something. We can hope right? The Director also pointed out that encouraging younger, more technologically savvy visitors is critical to ensuring that the museum remains relevant in the future. I am sure all of us GLAM folks share this desire to attract a younger audience. By far the most interesting thing from my perspective is that one of the geolocation datasets being used to determine the poke stops is the U.S. Historical Marker Database. The game has the potential to attract people who may not otherwise visit a historical monument or museum. However, this is not without its problems, as some of the poke stops have popped up in locations where gaming may be considered in bad taste (e.g. the 9/11 Memorial Pool at Ground Zero and the Holocaust Museum). They have also appeared in people’s houses, causing masses of strangers to descend and gather in bizarre groups outside people’s front doors. This article from The Atlantic asks some important questions about the mapping data used for the app and discusses one man’s experience with his home (a former church) becoming a ‘gym’ where players can battle their Pokémon characters. There are also the obvious safety issues, with users walking onto train tracks, crashing their cars, and breaking bones. 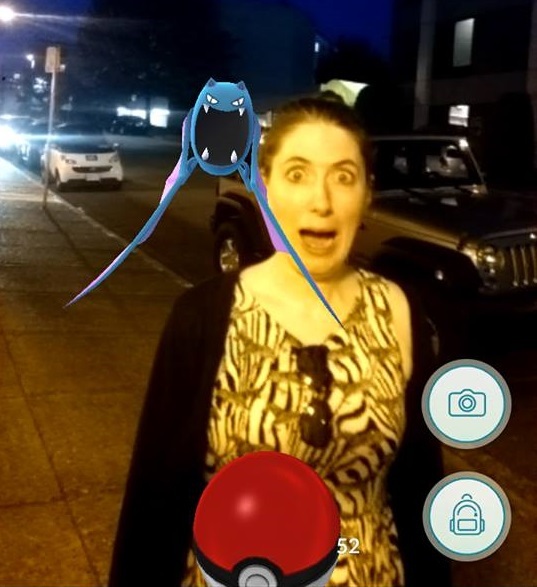 But, if this phenomenon gets people outside and exploring historically significant places and institutions, then I am provisionally on board (despite the fact that I was attacked by a crazy Pokébat on my way home last night – see feature image above). I just hope that people play with some curiosity, not just for the animated characters they can collect, but for the fascinating places that they may have otherwise walked right by. It will be icing on the cake if those curious collectors make their way into an archives. Apparently you can request new pokestops through the support website (https://support.pokemongo.nianticlabs.com/hc/en-us/requests/new?ticket_form_id=319928). I was interested to learn how they actually determined the location! There have been a number of stops around Vancouver that I probably wouldn’t have noticed otherwise. Thanks so much for the interest, Rob. Good tips!